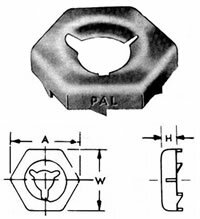 Self Locking Speed Nuts from Bolt Products, Inc. - Bolt Products Inc.
Single-Thread Engaging Self-Locking Speed Nuts® provide a unique dual self locking action. An inward thread lock combined with and an arched spring lock ensure strong and reliable holding power from all self locking speed nuts. These are versatile fasteners made from heat-treated high carbon spring steel. Self locking speed nuts are a perfect solution for numerous applications. Engineered with faster fastening and easier handling in mind. Self locking speed nuts eliminate spanner washers, lock washers, and other loose pieces. Do not clog with paint or "freeze" fasten to threads. 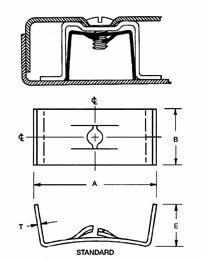 Speed nuts are designed to resist being loosened from vibration. Speed nuts provide maximum fastening power while requiring minimal installation torque. 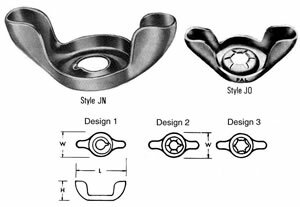 Our Self-Locking Speed Nuts® fasteners are available in a large range of variations and work with all major screw types and sizes. Contact Bolt Products today to request a quote for standard or custom self locking speed nuts.